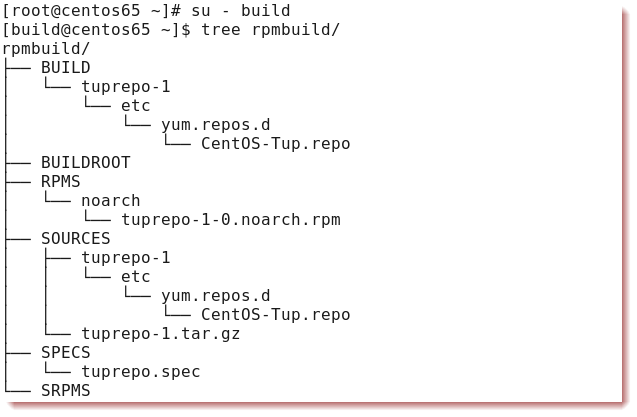 For this demonstration of building RPM files, we are going to use the simple scenario of wanting to distribute a YUM repository file easily to many machines using an RPM file. In this way, the RPM is installing just a single text file to /etc/yum.repos.d/ but the example would hold true for any plain text file distribution. The demonstration makes use of a CentOS 6.5 64 bit system. We use RPMs all the time on Red Hat, SUSE and CentOS systems without having to give it a lot of thought. Running through the RPM creation procedure allows you to consider using them in solving your own problems. We do not want to build RPMs as the root account and maybe not even our personal account. It is common to have some form of rpm build account, maybe even, innovatively called rpmbuild. Logging as that user to build RPM files. We now need to login as the build account, in our case. From the home directory of the build user run the following commands to create the directory structure required. This will create the directory rpmbuild with several sub-directories. This is the instructions for the build process and is created in the rpmbuild/SPECS directory. You can use rpmdev-newspec tuprepo.spec to create a sample file in your current directory. that should be SPECS. We can now use the rpmbuild process to create the rpm -v for verbose and -bb for binary rpm without source rpm. The RPM will be built in the rpmbuild/RPMS directory The final file structure should look like the following screenshot created with the tree command.